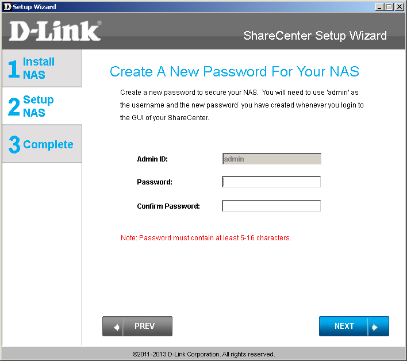 It's been a while since we tested a D-Link NAS for the last time. 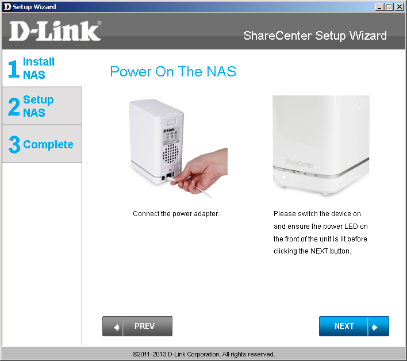 Now we decided to set it right and therefore we welcome our readers to the review of a two-bay NAS intended for use at home. 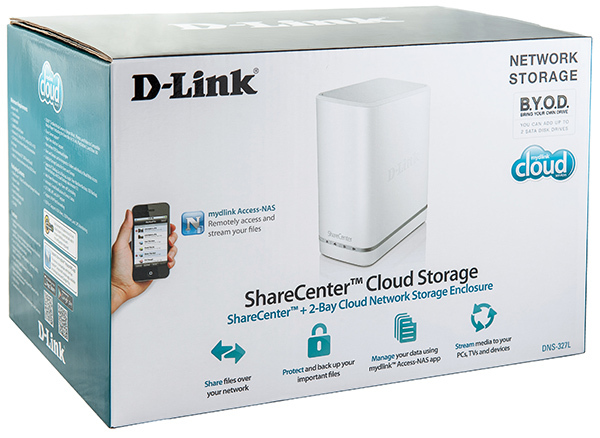 D-Link DNS-327L NAS comes in a white plastic case that has a downward cover. Its dimensions are 90x145x196 mm and its weight is just 640 grams. Frankly speaking, we have never seen such a design before and it looks pretty unusual. 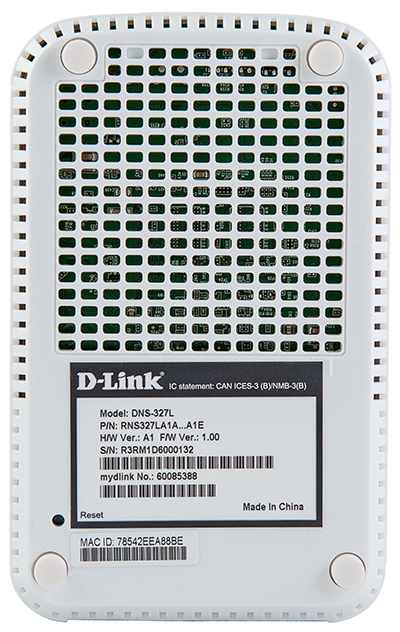 To work properly DNS-327L needs an external power unit (included in the box) with the following characteristics: 12V and 3А. The side panels of the device are not remarkable at all as there are only a 3D brand tag and thin grey stripe located on it. 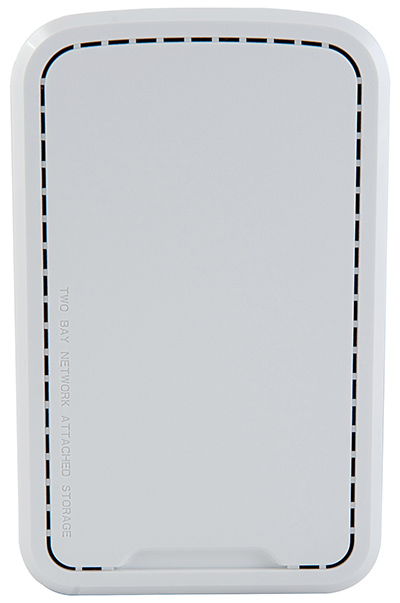 The upper panel is perforated around the edges and has a message saying that the device is a two-bay NAS. 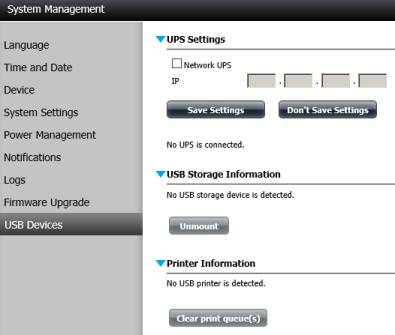 The front panel has two buttons located on it: one of them is a power ON/OFF button, while the other connects/disconnects the external USB data carrier and enables a USB backing-up feature. Apart from it, there are three LEDs indicating statuses of HDDs and connected USB device located on it. On the rear panel there is a sticker with brief information about the device and ventilation grate that has a 54x54 mm fan located behind it. We believe that installing a small fan in devices intended for use at home is not really feasible. As a matter of course, during our tests we were barely able to hear the fan noise, but quite often it gets louder with time. 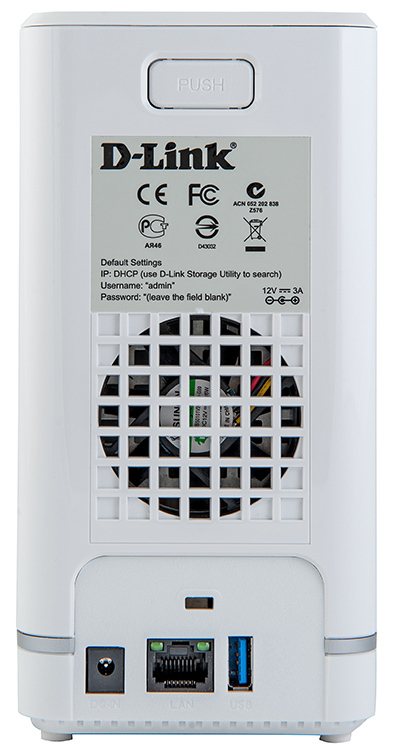 A Gigabit Ethernet network interface, USB 3.0 port, power socket, and Kensington lock are also located on the NAS rear panel. On the upper side of the panel there is a button used for removing the case cover. The bottom side of the NAS has four rubber legs used for desktop mounting. 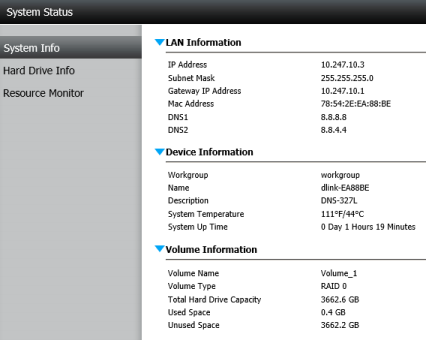 The device cannot be wall or rack mounted. The biggest part of the bottom panel of the case is a ventilation grate. Also, a sticker with extra information about the device and sunken Reset button are found over here. Hardware stuffing of the NAS is one card made of green textolite. All its main components are located on one side. 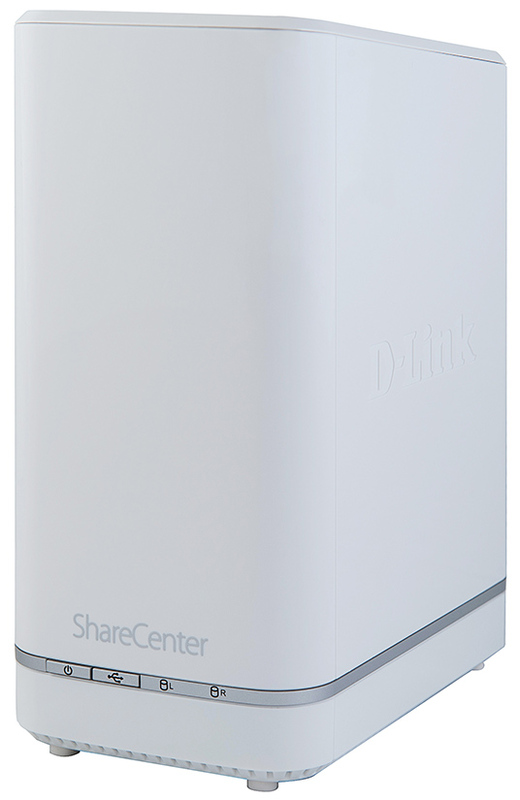 D-Link DNS-327L NAS is powered by 1.2 GHz Marvell 88F6707 CPU. Two Nanya NT5CB256M8GN chips act as the device RAM. 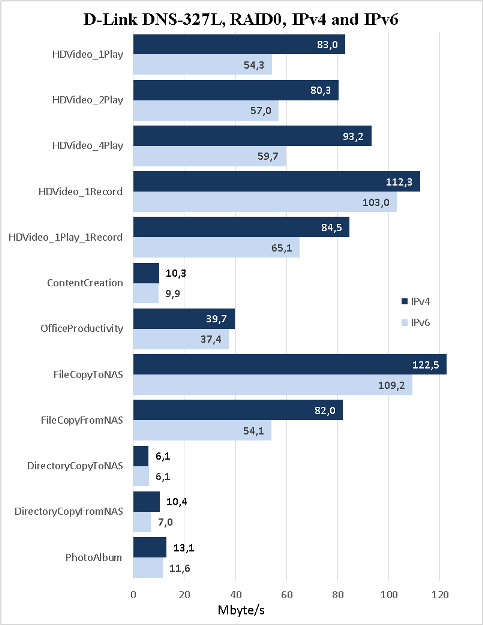 Each one of them has 256 Mbytes of memory, making the device total RAM size 512 Mbytes. 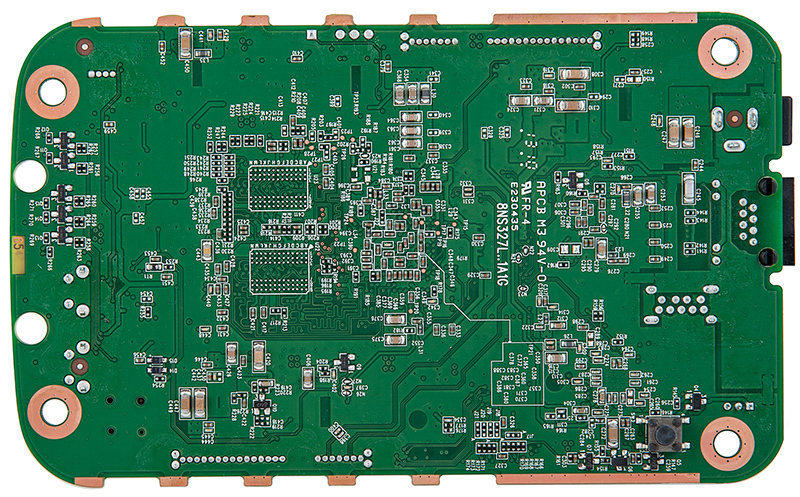 Hynix H27U1G8F2BTR module with the size of 128 Mbytes performs function of the flash memory. 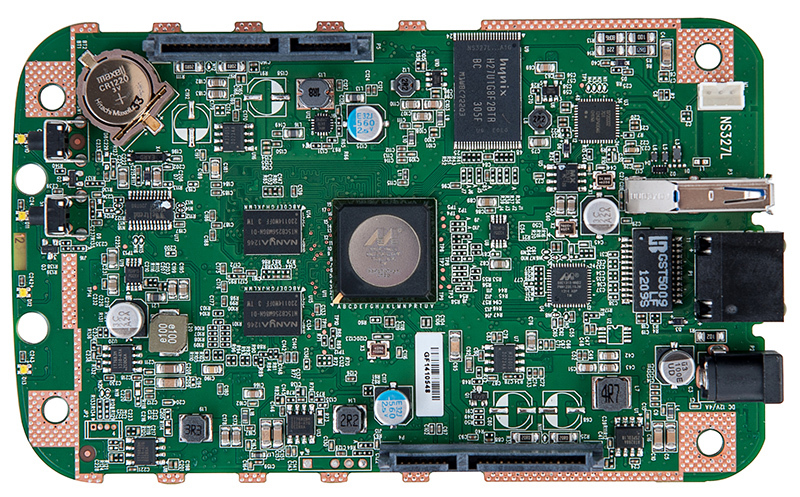 The network support is carried out by Marvell 88E1318-NNB2 chip, whilst operation of the USB 3.0 port is traditionally supported by Reneasas D720202 module. 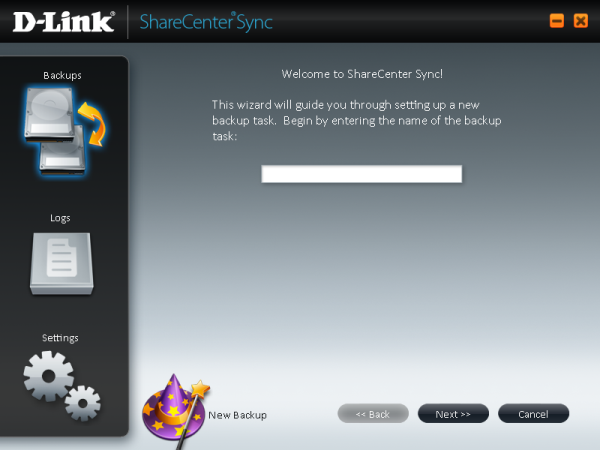 Once the device has been purchased, fitted with HDDs, and plugged in, one will need to set it up. 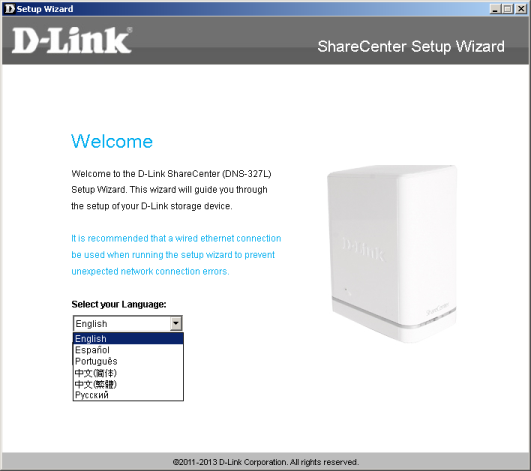 One can use Setup Wizard utility to detect D-Link DNS-327L within the LAN and perform all preliminary adjustment procedures. 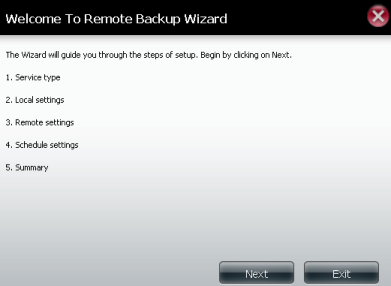 It'd be fair to mention that the user can launch Setup Wizard even before the discs were installed to the case because the utility will be providing the user with a step-by-step installation guide. 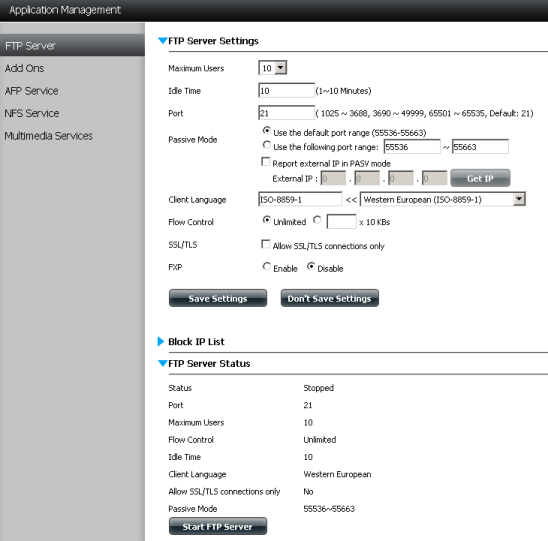 As soon as all necessary things have been done and the device has been plugged in and connected to the LAN, Setup Wizard will be able to detect it and perform the preliminary adjustments: setting up the administrator's password, managing the device name and its description, specifying the network operation parameters, synchronizing the time settings, creating RAID, installing extra add-ons, or connecting the device to mydlink service. 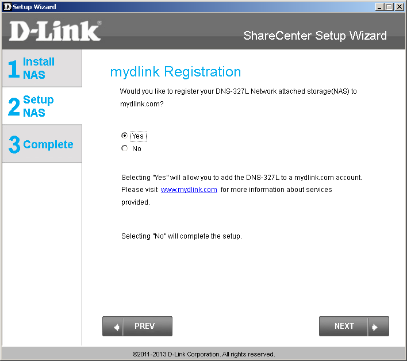 If necessary, mydlink service can help the user to get connected to the NAS and manage it remotely using both a PC and mobile device. 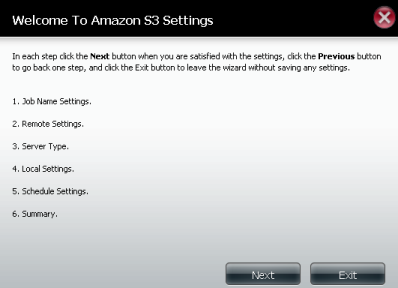 Once all preliminary settings have been made, one will be able to start using the device. 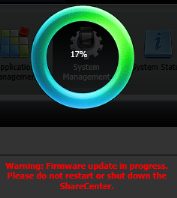 However, we would like to advise all users that before getting down to work they install the latest firmware in Firmware Upgrade menu item, Management menu, System Management group. Users who live outside of the English speaking world may need to have an applicable language pack installed and switched on. 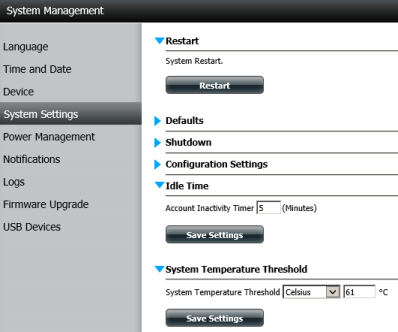 Corresponding settings are available in Language menu item, Management menu, System Management group. 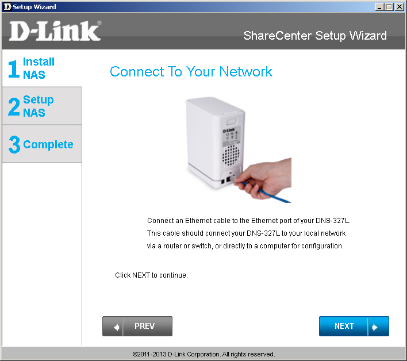 Apart from Setup Wizard utility we reviewed above, D-Link DNS-327L NAS users can also install several other programs. 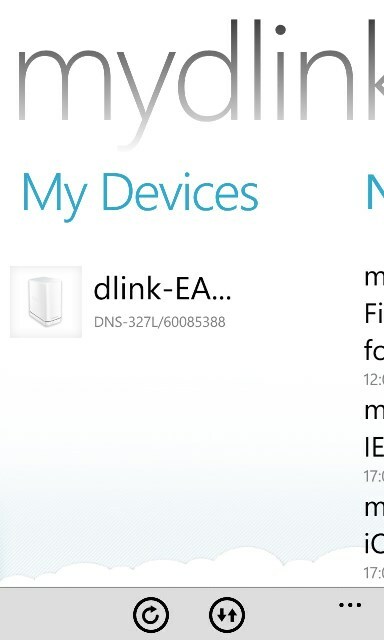 For example, D-Link Storage Utility—used to detect other NASes within the network and monitor alterations in their IP parameters—is one of them. 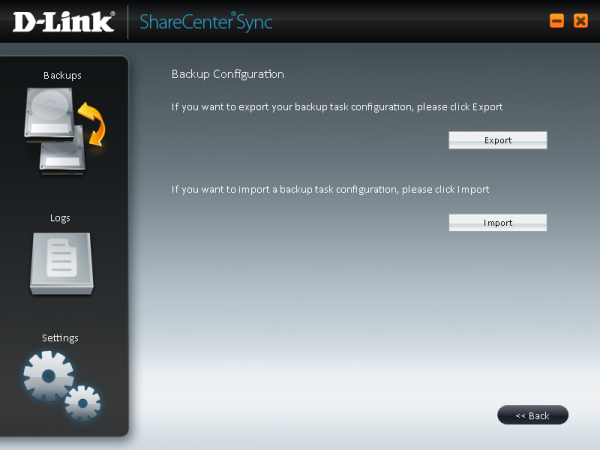 Anything associated with backing-up can be made using ShareCenterSync utility. 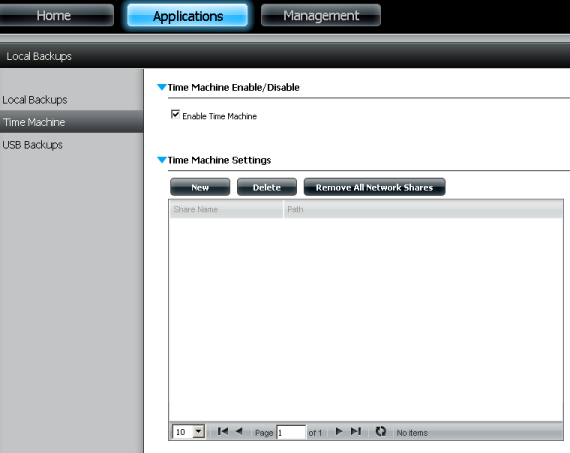 Now let's review capabilities of the device web-interface. 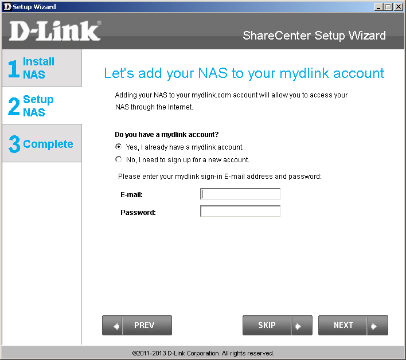 One can get connected to the NAS using any modern web-browser. 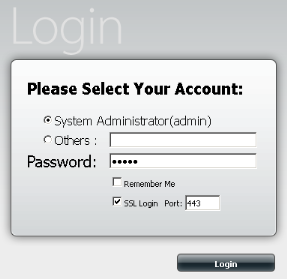 To do that the user needs to enter their login and password that they specified upon setting-up procedures. 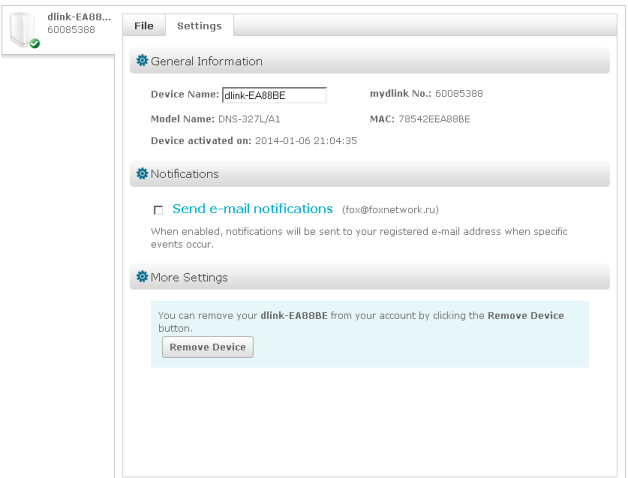 Upon successful authentication the administrator will find him/herself on the home page of the device. 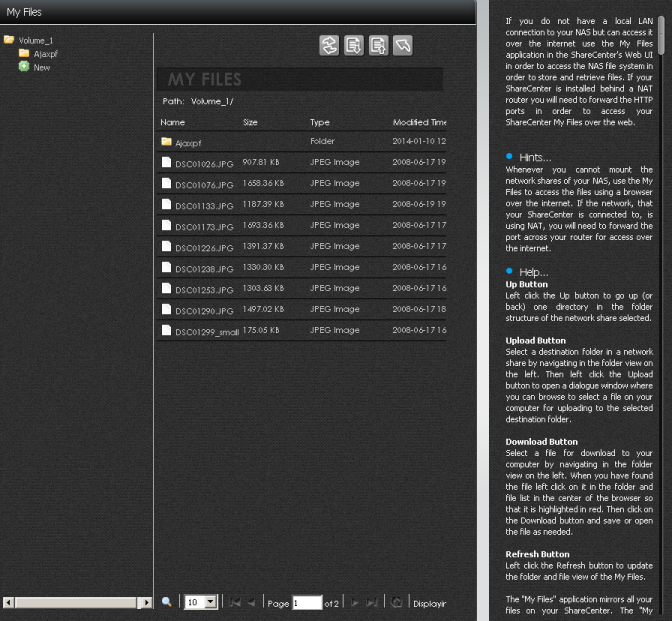 Over here s/he can obtain brief information about the disk space and preinstalled apps as well as review log data. 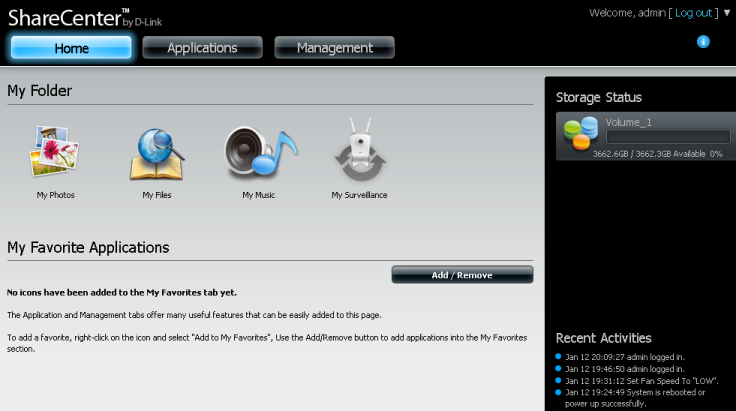 Among the preinstalled user applications are the following: My Photos (Photo Albums and Photo Gallery), My Files, My Music, and My Surveillance. 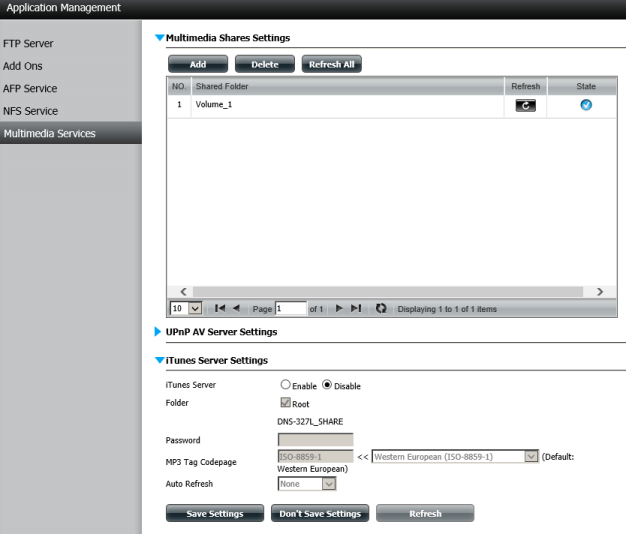 We'd like to mention that before using Photo Gallery and My Music modules, one will need to add a shared folder to Multimedia Services menu item, Management menu, Application Management group. 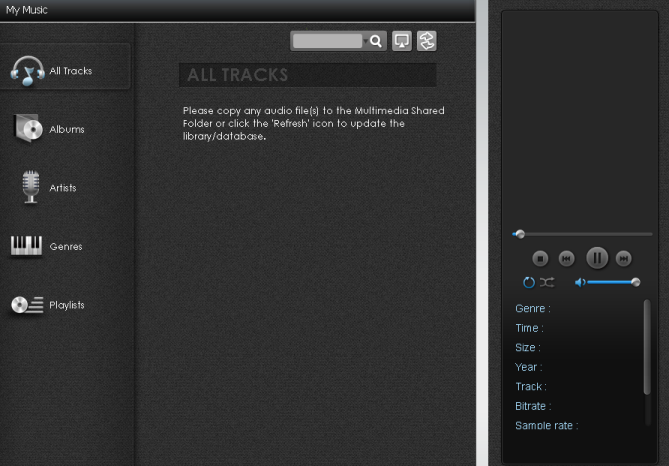 If necessary, the user can pick out images for the app icons on the home page of the web-interface him/herself. 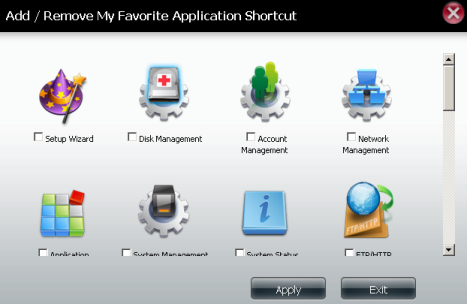 Applications menu provides the user with access to applications installed in the NAS. 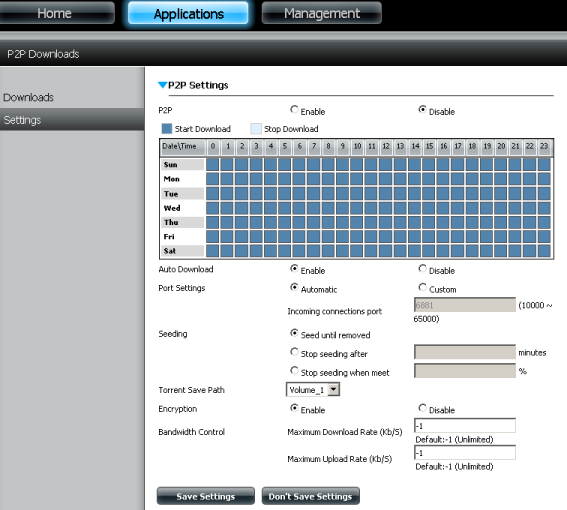 For instance, one can use FTP/HTTP Downloads and P2P Downloads groups to make the NAS automatically download the necessary file from the Internet or provider's network. Remote backing-up of user data is carried out using Remote Backups and Amazon S3 groups. 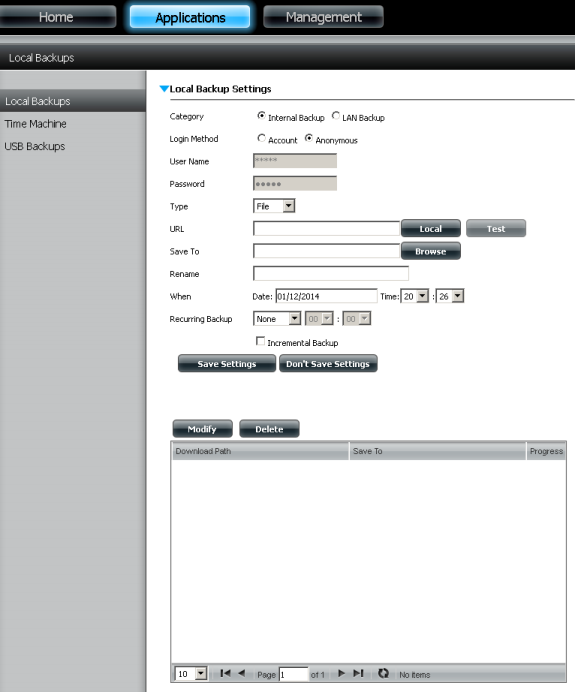 Local Backups group lets the administrator perform backing-up of the user data and copy them from one disc to another or to an external data carrier connected to the USB port. 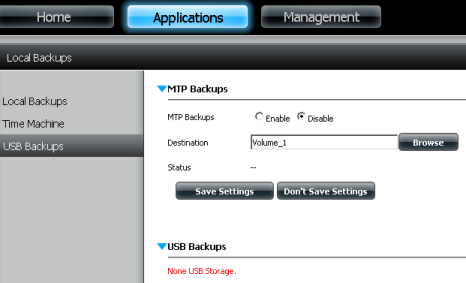 One can also use the LAN to backup files. 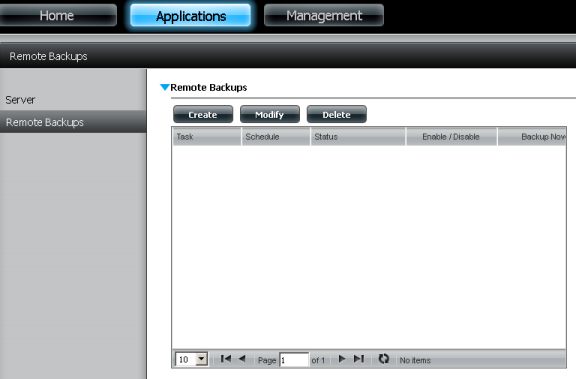 The administrator can also use a backing-up system for Apple devices, Time Machine, over here. 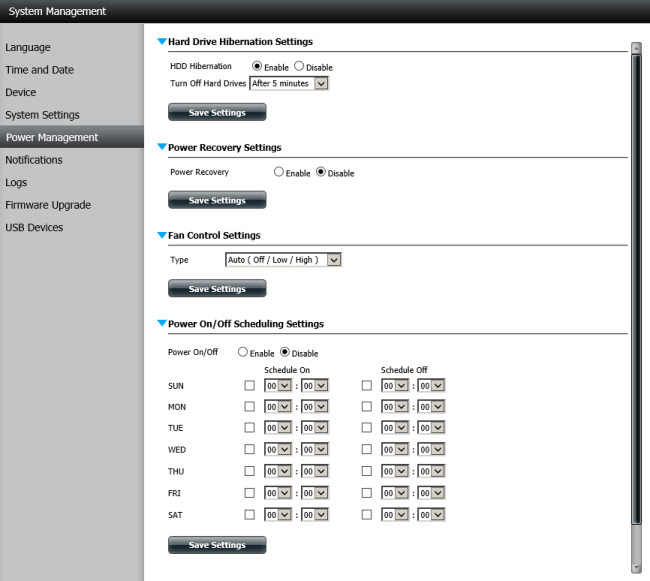 Menu items in Management menu let the administrator adjust the key NAS operation parameters using a special-purpose wizard, manage the whole device or its certain parts, adjust the network connection, and install add-ons. 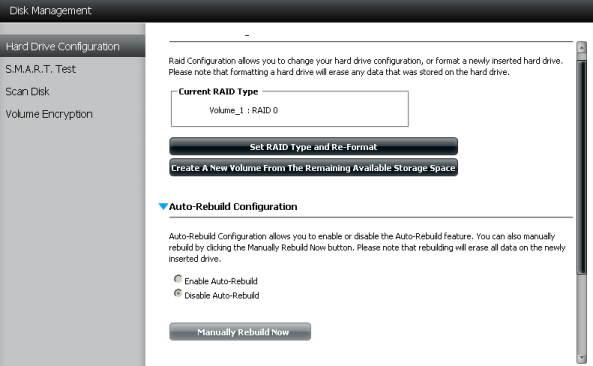 For example, one can use Hard Drive Configuration menu item to create or delete a RAID, format the data carriers, alter parameters of disk checking, or manage data encryption. 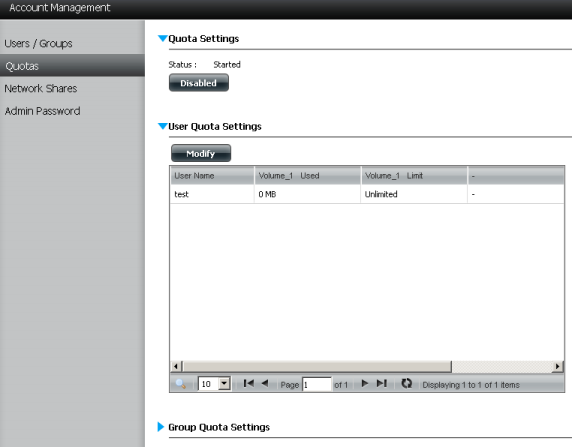 Management of local users and groups is carried out using items in Account Management group. 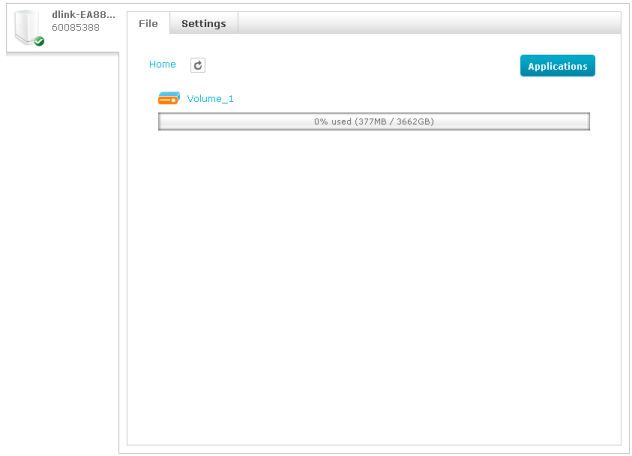 The same group is used to specify quotas for certain users and groups, manage access right to the public shared folders, add ISO disc mounts, and change the user's password. 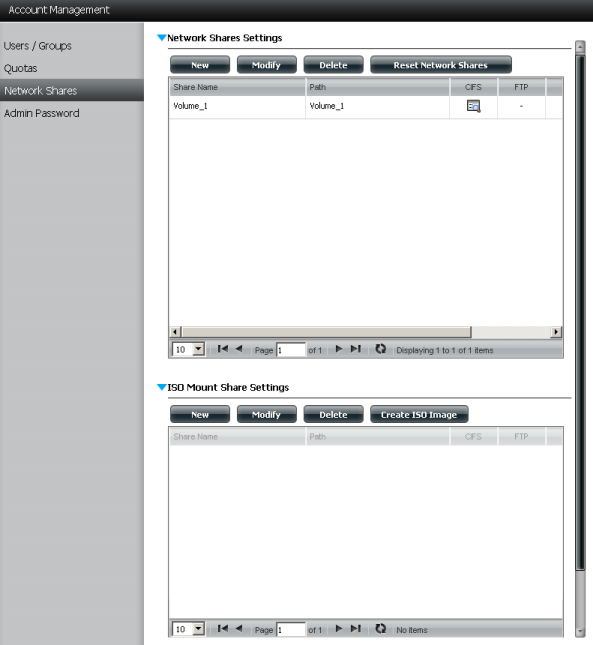 Network Management group is used to manage the LAN. 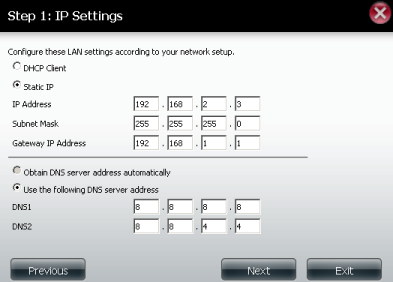 In this group the administrator can specify IPv4 and IPv6 parameters, select the Ethernet port operation speed, adjust DDNS operation, and manage port forwarding settings (only in case if the router supports UPnP). 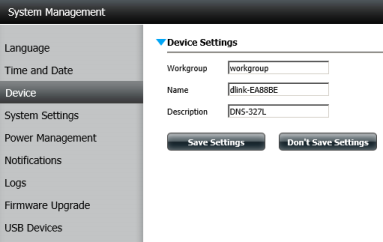 Application Management group in D-Link DNS-327L web-interface is used to manage the following services: FTP, AFP, NFS as well as other multimedia services. One can also use it to install extra add-ons. 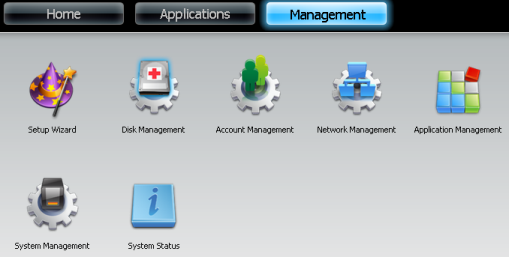 System Management group is used to manage language and time settings, power settings, system log information, firmware upgrade settings, and connected USB devices. 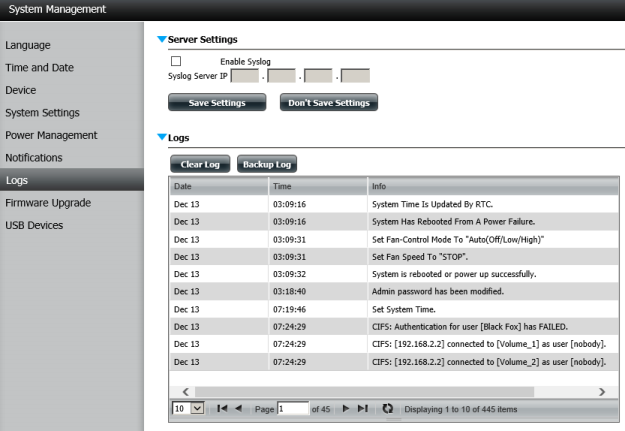 Brief information on the status and load of the device is located in System Status group. 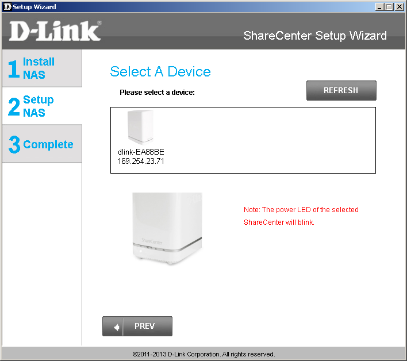 That's where we proceed to completion of the review of D-Link DNS-327L NAS web-interface capabilities and pass directly on to testing it. 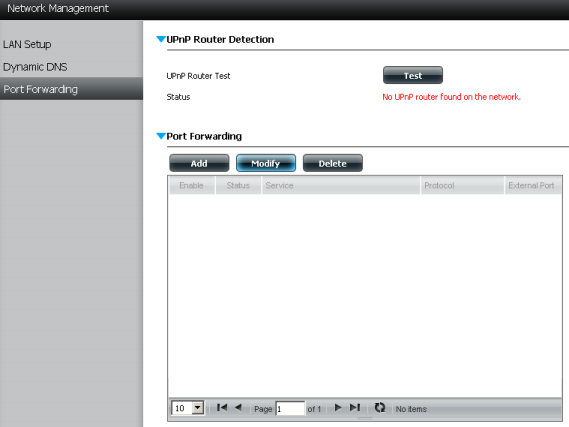 The first testing procedure we usually begin our testing section with is estimating the booting time of the device, which is a time interval starting with the moment when the power is on until the first echo reply is received through ICMP. 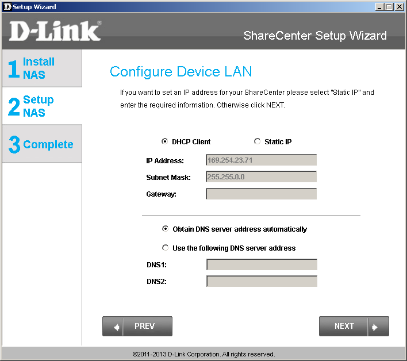 D-Link DNS-327L NAS boots in 106 seconds. We believe that this result is decent. 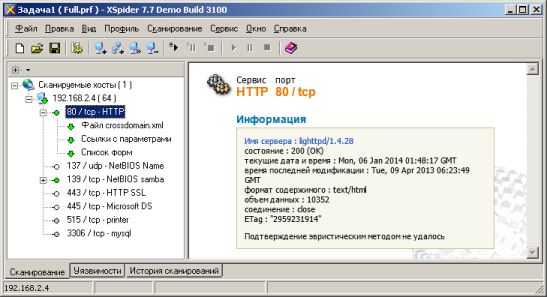 The second traditional test is a security scanning procedure, which has been carried out using Positive Technologies XSpider 7.7 (Demo build 3100) utility. On the whole, there were seven open ports discovered, and they are TCP-80 (HTTP), UDP-137 (NetBIOS Name), TCP-139 (NetBIOS samba), TCP-443 (HTTP SSL), TCP-445 (Microsoft DS), TCP-515 (printer), and TCP-3306 (mysql). The most interesting data of those we obtained are presented below. Before getting down to performance tests, we would like to provide our readers with brief information about the test stand we used. 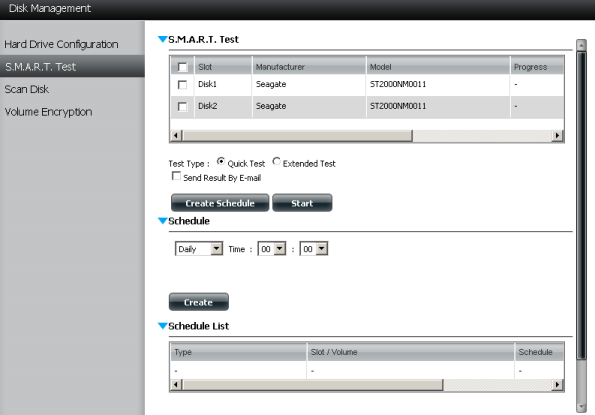 In order to test the device we used Seagate Constellation ES ST2000NM0011 HDDs. 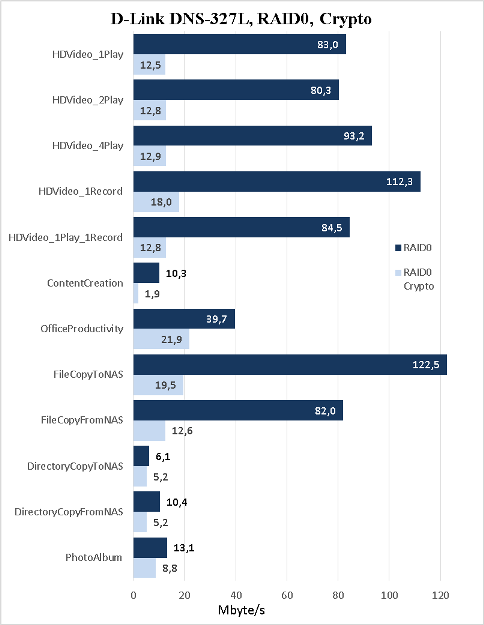 The RAM size available to the system has been intentionally reduced using msconfig utility in order to satisfy the requirements of Intel NASPT 1.7.1 test utility. 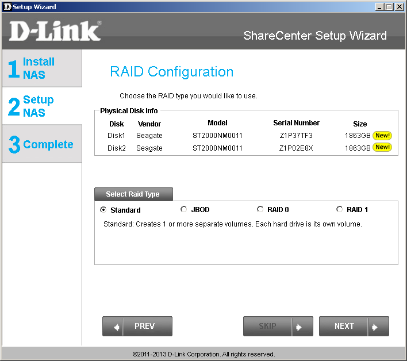 D-Link DNS-327L supports the following RAID types: JBOD, RAID0, and RAID1. The device can also properly function if only one disc is available. 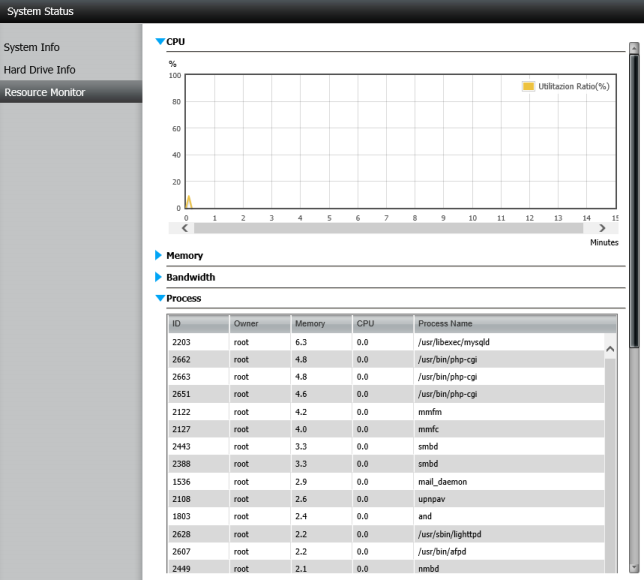 In our first performance test we measured the data access speeds using every of the above-mentioned RAID types. We connected an external USB disc to the USB 3.0 port located on the rear panel of the device. 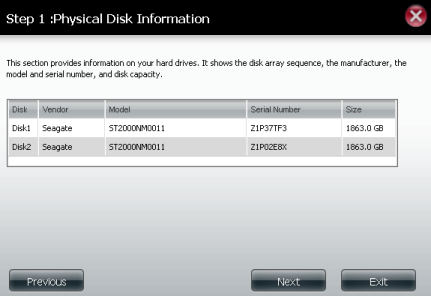 The disk has been successively formatted into these file systems: NTFS, FAT32, EXT2, and EXT3. Neither have we overlooked a feature of encryption of the user data located in the NAS. The measurements were taken for RAID0. As we can see on the diagram below, encryption leads to a significant decrease in the device performance in case many activities are carried out all at once. 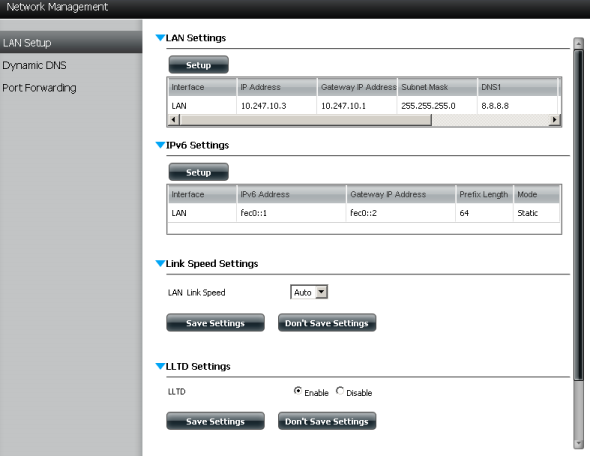 Since D-Link DNS-327L NAS supports IPv6, we decided to do a comparison test of data access speed using IPv4 and IPv6. 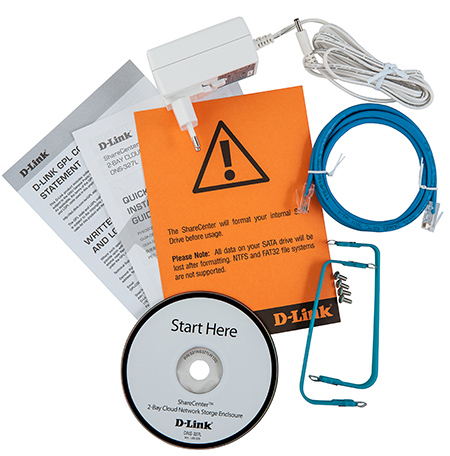 Generally, we are quite glad about the reviewed two-bay D-Link DNS-327L NAS that has one Gigabit Ethernet network port and one USB 3.0 interface. We believe that DNS-327L capabilities are more than enough for an average home user, whilst the attractive price is yet another great advantage of this NAS. 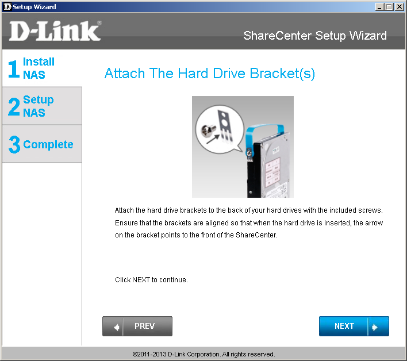 Strength areas of D-Link DNS-327L NAS are presented below. 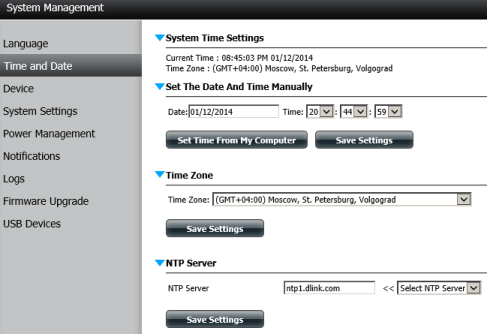 As of when this article was being written, the average price for D-Link DNS-327L NAS (without discs) in Moscow online shops was 5100 roubles.